SAN FRANCISCO, Aug. 2, 2018 /PRNewswire/ -- John Clark and Sean Kelly, of Heffernan Retirement Services, a division of Heffernan Insurance Brokers, have been selected as delegates to the National Association of Plan Advisors' (NAPA) DC Fly-In Forum, an exclusive gathering of the nation's leading retirement plan advisors. As a NAPA DC Fly-In Forum delegate, John and Sean met in Washington, D.C. to listen to and brief top congressional leaders about the importance and future of the nation's workplace retirement plans, and, as advocates for the employers and participants they work with, share how proposed laws and regulations might impact American workers' retirement security. Keynote speakers include Senator Todd Young (R-IN), Rep. Richie Neal (D-MA-01), Preston Rutledge, Assistant Secretary US Dept. or Labor, and SEC Commission Hester Peirce. 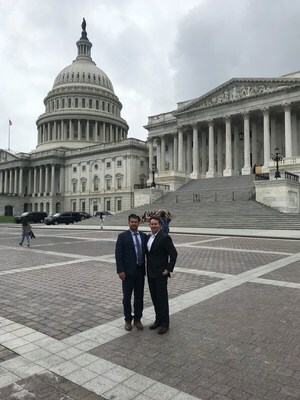 John and Sean, members of NAPA, are two of approximately 200 delegates selected to participate in the fifth annual NAPA DC Fly-in Forum July 18-19. NAPA DC Fly-in Forum delegates will hear updates on federal regulations and tax reform affecting the retirement plan industry from top congressional leaders, and industry experts. On the second day of the forum, delegates will meet one-on-one with their respective congressional representatives on Capitol Hill to share insights from the experiences they have on a daily basis with business owners and plan participants. Heffernan Retirement Services is a full service financial services firm, offering strategies for corporations, foundations and individuals. With a dedicated team focused solely on retirement plans, the group has over seventy-five years of combined experience in consulting and advisory services. The advisors of Heffernan Retirement Services serve $50.7 million in brokerage assets through LPL Financial and $2.6 billion in advisory assets through Global Retirement Partners for 106 clients (as of 12/31/17). Heffernan is also proud to be a founding member of Global Retirement Partners. For more information, visit heffgroupfs.com. The financial consultants at Heffernan Retirement Services are registered representatives with, and Retirement Plan Consulting Program advisory services offered through, LPL Financial, a registered investment advisor, member FINRA/SIPC. Other advisory services offered through Global Retirement Partners, LLC (GRP). GRP, Heffernan Retirement Services, Heffernan Financial Services and Heffernan Insurance Brokers are separate entities from LPL Financial.